I am not going to lie about how EXCITED I am about this nail art. Detail work has become difficult for me over the last few months. Sure, this is not the most intricate but I still love it: cute and simple. Though, I have to buy better detailing brushes. I used the smallest I own and it was still a bit big. I hope you enjoy my Tri-Polish Challenge (Facebook group linked here) manicure this week! 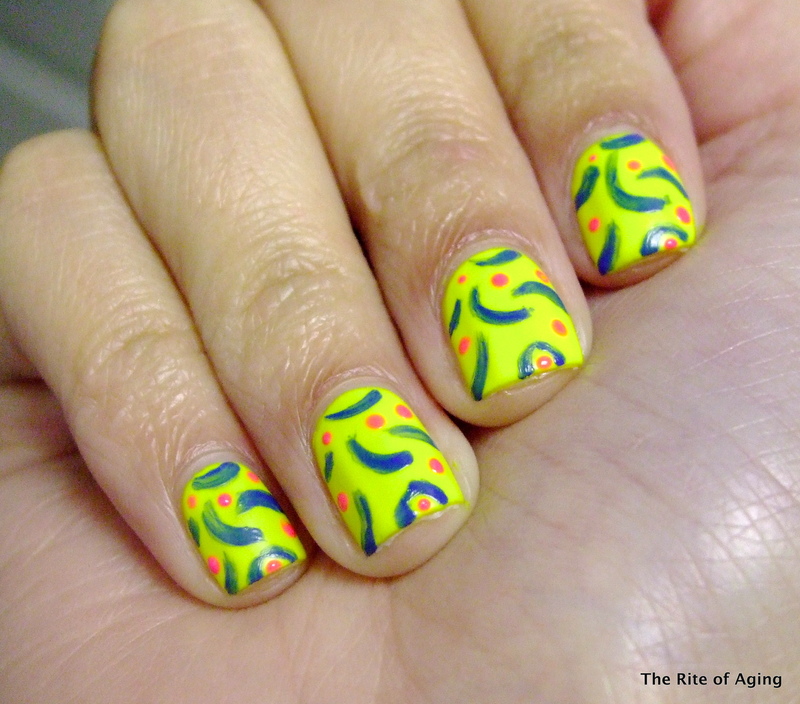 I used 3 coats of American Apparel Neon Yellow as my base. The formula is surprisingly easy to work with. It goes on smooth and does not dry so fast I cannot manipulate the layers. It does dry funky though, exactly how a highlighter would. I really love this nail polish. I mean, NEON YELLOW, need I say more? I detailed with Urban Outfitters Blue Velvet and Color Club Poptastic. I actually found it easier when I thinned the polishes with nail polish remover. I had to go over the design a couple of times but it looks so much better than if I used the polish straight from its bottle.